Windows 8 built-in function can create a recovery partition, but it requires users to prepare some storage device. 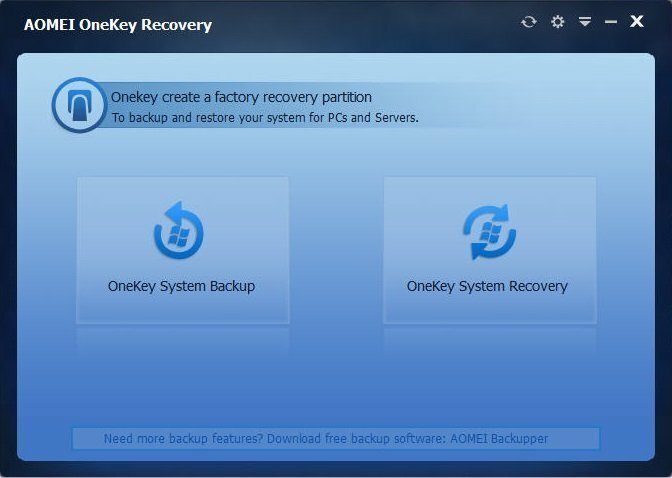 If you want to create A recovery partition easily, AOMEI OneKey Recovery can help you do it. The importance of backup needn’t be explained too much to every users of computer. But in many case, there are always some people regretting and complaining about computer crash or operating system crash around the world. It has stressed the magnificent of backup again. Now, besides traditional ways to back up, such as copy files and data to external hard disk. Recovery partition is the great way to backup your system. Recovery partition may be a little strange to some one, but other words “Partition Recovery ” may be not. First you need to know some basic knowledge about hard disk and partition before knowing recovery partition. Disk partition is some space of your hard drive where you can store files, documents, and where the computer stores all files needed to boot Windows. Disk partitions always have a name; it is a single letter and a colon. The most common one is:. Just open up My Computer and you will see all your partitions under Hard Disk Drives. When computer partition is deleted or lost by accident, you will want deleted or lost partition to be recovered with any tool. You would use Diskpart or third-party software such as AOMEI Partition Assistant. As the same theory, if you your C: has broken or crashed, maybe you will want to find a way to recover it. That’s will beyond the ability of computer built-in function or AOMEI Partition Assistant. you have to take other measures to make system backup and restore. As mentioned above, recovery partition actually is a partition that stores system partition backup, and you can restore system from that partition anytime. Recovery partition can be USB flash drive, external hard disk, DVD/CD, even a invisible partition in computer. Windows 8 can help you to create a recovery drive (USB) or system repair disc (CD or DVD) that can be used to troubleshoot and restore your computer. Each type of recovery media gives you access to Windows’advanced startup options. You can also copy your computer’s recovery partition to the drive, creating a backup copy. After you create the backup copy, Windows will allow you to remove the recovery partition from your computer, freeing up gigabytes of space. 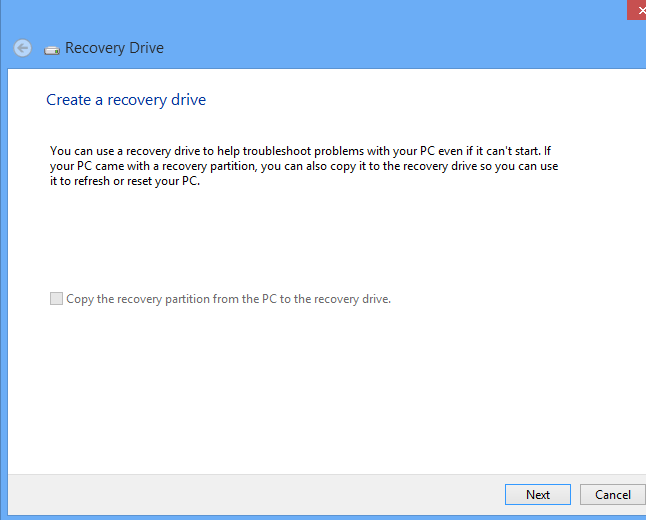 To open the recovery drive creation tool, press the Windows key and type recovery drive. Click or tap the Settings category and launch the Create a recovery drive application. The Recovery Media Creator opens on your desktop. If your computer came with a recovery partition, you can copy it to the recovery drive. Of course, this will use much more space, so you’ll need a large enough USB drive. Click the Next option and you’ll be prompted to select a connected USB drive. Click the Create button and the files will by copied to your USB drive. After the process is complete, you’ll be asked if you want to delete the recovery partition. 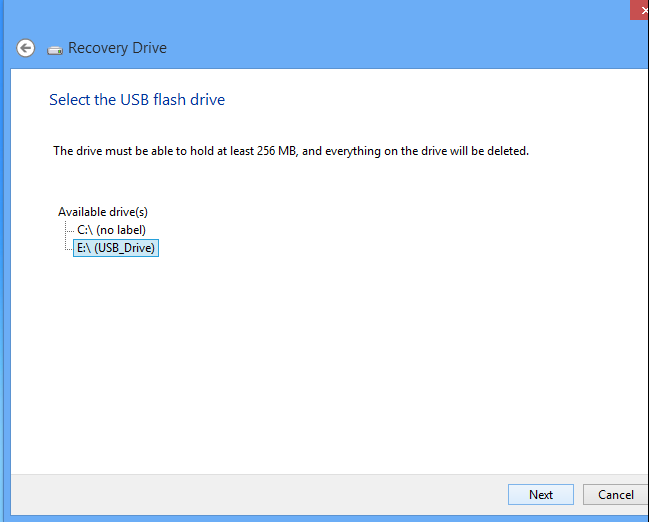 The ability to create a USB recovery drive is new in Windows 8. In Windows 7, only system repair discs were supported. This option is also present in Windows 8. To open the disc creation tool, press the Windows key, type recdisc, and press Enter. The disc creator will open on the desktop. Select the disc-burner drive with a writable CD or DVD in it and click the Create disc button to create a recovery disc. Maybe some people are so happy to know that it can be made by computer built-in function， but some one are confused by the steps above, because it is not simple and easy to do it. you have to prepare a USB flash drive, or a blank DVD/CD. 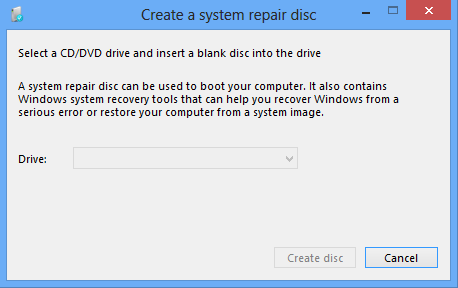 you have learned create a recovery windows 8 recovery partition in USB or DVD/CD. There have a other way you may be interested in---you don’t have to prepare anything except download a software—to create a recovery partition. OneKey Recovery is usually used to create a recovery partition, no matter the system is windows 7, or windows 8. All people have learned OneKey Recovery via computer preinstall application you bought. For example, if you buy a computer with Lenovo brand, there must a application called Lenovo OneKey Recovery. A button is next to “startup” one is recovery in Lenovo computer keyboards. If you back up your system, when you press recovery button after starting computer, the computer will be recover backup and restore to the state of former backup. The difference of Onekey Recovery is all system backup will be stored in a invisible partition of computer, and you don’t have to prepare any other external storage devices. Once backup finishing, you can press the certain key to restore system in the startup time. The advantage of OneKey Recovery is you can backup and retore system anytime and anywhere. Once computer crashing, you can use OneKey Recovery. Now, many brand computer have designed their OneKey Recovery, such as Lenovo, HP, Toshiba,etc. to users, it is a good way to keep computer security. But it has a huge disadvantage that all standard can’t be same, which will takes users’ time to learn seldom-used skill. For example, a person who have used Lenovo computer for many years want to buy Toshiba computer, he may be confused by Toshiba recovery wizard when he want to make a recovery partition. Besides, all built-in OneKey Recovery software in brand computer can’t install other brand computer, such as Lenovo OneKey Recovery can’t be used in Toshiba computer. Is there a kind of OneKey Recovery software that is very easy to operate and can be installed in different type of computer? Yes, the answer is positive. AOMEI OneKey Recovery is better choice for common users. Being a non-branded computer OneKey Recovery, AOMEI OneKey Recovery is not designed for specific brand computer, but for all type of PCs and computers, and you don’t need to prepare some external storage device, such as DVD/CD or USB. The system image file will be stored in the invisible partition of computer. It is very concise and simple for every users to operate this interface. One button is backup and the other one is recover. If you want backup your system and create a recovery partition, you can click the backup button. If you have created a recovery partition that was made by AOMEI OneKey Recovery, you can click “recover” button. If computer can’t be started, press A key and computer will be recover to the state you made the latest system backup. Practice is the only law to judge theory. You can download and experience in AOMEI OneKey Recovery official website.